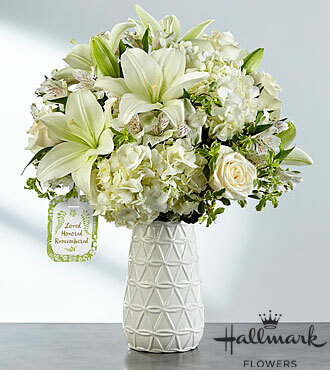 A remarkable way to send peaceful, loving thoughts to your recipient as they grieve the loss of a loved one, The FTD Loved, Honored and Remembered Bouquet by Hallmark is the perfect sympathy gesture. White roses, Asiatic Lilies, hydrangea and Peruvian Lilies are accented with lush greens to create an elegant bouquet blossoming with a serene sophistication. Presented in a keepsake white ceramic vase embossed with a modern woven design pattern, this flower arrangement arrives with a special Hallmark tag that reads, Loved, Honored, Remembered to create a wonderful way to commemorate a life well lived. STANDARD bouquet includes 13 stems. You save over $6 at FlowersFast! (Compare to FTD retail price: $80 + $22.98 for same-day delivery.) You get the same quality, at a lower price! No extra charge for same-day delivery. FREE personalized gift message included. (Extra delivery charge for Alaska and Hawaii) Same-day florist delivery is available for this item, for orders placed before Noon in the recipient's timezone. Please see the Ordering and Delivery Information.